Sauvignon Blanc can be a hard wine to match with food. Not so in the case of this great recipe by UNNA BURCH. — Huia Vineyards Ltd.
Sauvignon Blanc can be a hard wine to match with food. Not so in the case of this great recipe by UNNA BURCH. 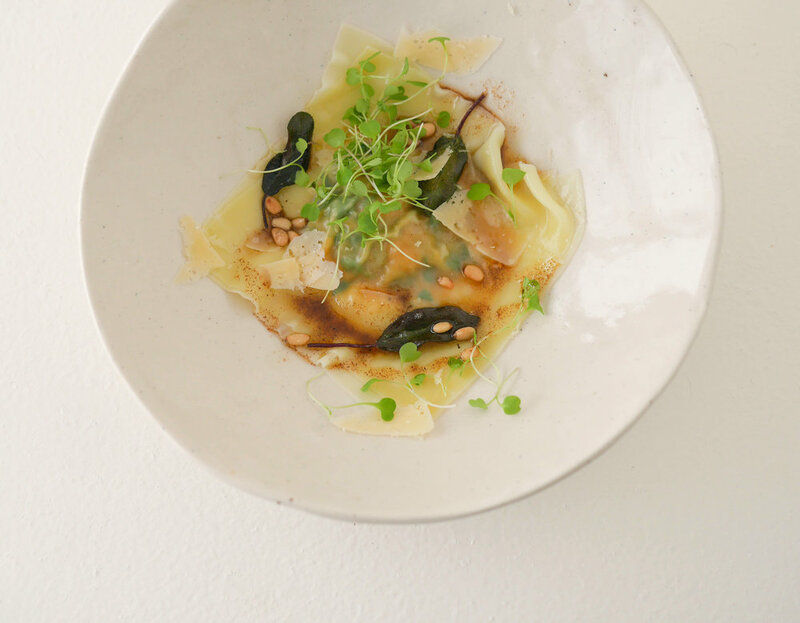 A super easy pasta cheat is using won ton skins to make ravioli. You can find them in the freezer section of Asian supermarkets. They are inexpensive and have the perfect thickness and texture! My favourite filling is pumpkin and it has to have a burnt sage butter sauce! The Parmesan gives a salty/creaminess and the pine nuts add extra nuttiness. This is such a good entrée and depending on what else you were serving, I would say two pieces per person would be a good serve. You can also make these ahead of time but make sure you layer baking paper between if you wish to stack them and make sure they are air tight in the fridge so they don't dry out. To make the ravioli, there is a cornflower dusted side to each won ton skin, put this face-up and take a pastry brush and brush the surface of the skin with water. Take a tablespoon of the filling and put a rounded pile in the centre. Take another wonton skin and brush the cornflower side with water again and lay over the top (the water and the cornflower acts as a 'glue') sealing the edges around the filling first, and then making sure all the air bubbles are out. Lift and give it a final press. You want to make sure there are no openings otherwise the filling will come out during cooking. Repeat process, putting each one on a baking paper-lined tray to prevent sticking together. To cook, generously salt each pot of water. Drop ravioli in (don't overcrowd - I do 6 per pot) and cook for 4 minutes. While the pasta is cooking, heat the butter in a small sauce pan over a medium/high heat and brown it so it goes nice and dark and nutty, but not burnt. Add the sage leaves to go crispy then remove from the heat. Pull the ravioli with a slotted spoon and put on to the warmed plates. Spoon over the butter and crispy sage leaves. Top with pine nuts, Parmesan, and micro greens. Serve immediately with a generous glass of chilled Huia Sauvignon Blanc!